Practice the scientific method with this sports-themed coloring worksheet. This worksheet gives your students practice with independent variables, dependent variables, and hypotheses. In the worksheet, students read scientific questions and identify variables by coloring stars. Then they write hypotheses. An answer key is included. 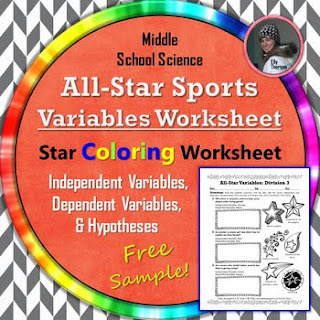 This worksheet is a free sample from the All Star Sports Variables Coloring Worksheet Set, which includes three coloring worksheets to practice independent variables, dependent variables, constants, and hypotheses. Do your students need practice with variables and hypotheses? The Hypotheses and Variables Big Worksheet Bundle will give your students all the practice they need to master this concept. Get ALL of my Scientific Method Resources (including this one) in my Scientific Method HUGE Bundle! Take a look at the many other Scientific Method resources in my store.